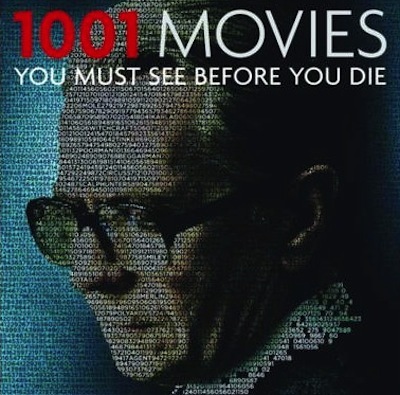 The 2012 edition of 1001 Movies You Must See Before You Die, edited by Steven Jay Schneider, has been released. As in previous editions (2005, 2006, 2007, 2008, 2009, 2010, 2011), changes to the list have been limited to the most recent films. Fourteen films have been removed, including the South Korean western The Good, The Bad, & The Weird and Roman Polanski's award-winning The Pianist. The Passion Of The Christ, first deleted in 2009, then reinstated in 2011, has been deleted again. The fourteen replacement films include Shame, The Girl With The Dragon Tattoo, Tinker Tailor Soldier Spy, The Tree Of Life, Hugo, and The Artist. Do you have the complete deletion/replacement list? Yes, the .pdf icon at the end of the post is a link to the complete 2012 list. That correlates with 14 additions. I've compared the 2011 and 2012 editions page by page, and made some corrections to the post and PDF. Yes, there are 14 changes, but not exactly the same 14 that you list above. Paranormal Activity is still included in the 2012 edition. The other removal is The Good The Bad & The Weird. So the 14 deletions are: Uzak, The Pianist, The Best Of Youth, The Passion Of The Christ, Paradise Now, Borat, Apocalypto, Once, The Good The Bad & The Weird, The Hangover, In The Loop, Fish Tank, Monsters, Four Lions. And the 14 new entries are: Senna, Le Havre, Shame, The Tree Of Life, The Kid With A Bike, The Girl With The Dragon Tattoo, Tinker Tailor Soldier Spy, Drive, War Horse, A Separation, Bridesmaids, The Descendants, Hugo, The Artist. Thanks for the corrections. I've taken some quick looks at the other PDFs you have posted over the years. I did this because I maintain a wiki on the 1,001 Movies and among the entries there are the changes to be found in each edition. I compiled the info from multiple sources since I do not own every edition of the book. (I have 2003, 2004, 2005, 2008, and 2011). One thing I noticed is your 2006 entry where you mention Tetsuo was removed. I own the 2005 edition and Tetsuo was actually removed then. It DOES have an index entry listed in the 2005 edition, but the actual text does not contain it. If you scroll down you will see the section for the book editions with a link to them. It appears from your posts as if you have every edition since 2005. If you see something there that appears to be incorrect, can you leave a comment on the wiki regarding this? I'm asking for this rather than just having you update it because I would like to be able to doublecheck it against the other sources I used. Thanks. Thanks for the correction. It's good to know that someone else is also keeping a record of the various 1,001 editions. I bought every edition since 2003 (and put the lists online in 2005 - along with many other greatest-film books/lists - because that's the year I started my blog). Surely the idea of a WIki is that it is instantly updatable? Seems strange to ask for someone not to edit it because you want to double-check. People (myself included) would hopefully only make edits if they were qualified to do so. You are correct about wikis. Unfortunately, what should happen with them rarely is what actually happens. I have seen far, far too many correct entries on other wikis altered by well-meaning people, which then drove away the people who had worked so hard to get the info onto the wiki in the first place. Even on this 1001 wiki there have been some anonymous people make arbitrary changes to some things, which caused not hours of work to undo, but still time spent fixing things that could have gone to something else. My apologies if my request came across as offensive. That was not my intent. I'm sure my approach actually subconsciously stems from decades of genealogical research where sources should always be doublechecked before information is committed to a record. And what about Kill Bill? It's not on your list but was in the 2011 edition? @Scott - I can't speak for Mat, but I checked my copy of the 2011 edition and Kill Bill Vol 1 is not in it. It was added in 2004, removed in 2006, re-added in 2008, and it was removed either in 2010 or 2011. One source I found said it was removed in 2011, but that would have thrown off the total number of adds and deletions, which makes me wonder if it was removed in 2010. I also checked my 2011 edition, and Kill Bill is not included. I thought it *was* in the 2010 edition, but I can't check my 2003-2010 editions at the moment. OK thanks! Many 1001 lists maintained Kill Bill in the 2011 one (ex: icheckmovies.com) while Fanny & Alexander is missing. Glad to see that F&A deletion was a mistake. @Scott and Matt - This is more than a month after the fact, but I have now been able to confirm when Kill Bill Vol. 1 was removed (by looking at the actual 2009, 2010, and 2011 texts). Kill Bill Vol. 1 was removed in 2011. Some sources had reported it as being 2010 and that Fahrenheit 9/11 was removed in 2011. Actually, Fahrenheit 9/11 was the film removed in 2010. The 1001 Movies wiki has been updated to reflect this information. It's hard to know the ones to erase. Last years covers were pretier with psycho and monsters if im not mistaken. I dont agree with the inclusion of tinker tailor and hugo. And i miss the movie Once that has been deleted this year. Psycho was my favourite cover, too. Their covers policy has changed: they used to put classics on the cover, but now the cover is a film from the previous year. I do like Hugo; it's a tribute to Melies and silent cinema, and a new direction for Scorsese.